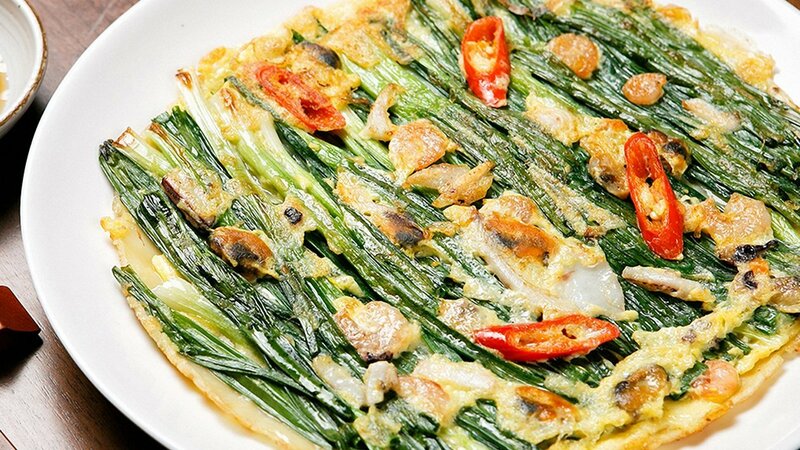 Part omelette, part pancake: this is a Korean classic, packed with seafood and spring onions. Prepare the seafood, spring onions, and optional peppers, draining the excess water. (Wet ingredients will make the pajeon soggy) Mix the seafood with the sesame oil. In a large bowl, mix the pancake mix with 900ml of icy cold water and the egg. Add a little more water until the batter is slightly thick but still runny. (For crispy pajeon, the batter should be relatively thin). Mix in 2/3 of the seafood. Heat 2 to 3 tablespoons of vegetable oil in a non-stick pan over medium heat. Ladle ½ of the mixture into the pan and spread it evenly into a thin-round shape. Arrange the spring onions in lines on top of the batter and add ½ of the remaining seafood and a few slices of the optional peppers. Cook until the bottom is golden brown, approx. 3-4 minutes and turn it over, adding more oil, approx. 2-3 tablespoons. Turn up the heat briefly to medium high to crisp up the pancakes. Press it down with a spatula, and cook for another 3-4 minutes. Repeat the process with the remaining batter and ingredients. Serve hot off the pan with a dipping sauce. This dish is best prepared a ’la minute.